Happy Bloggers Challenge Friday! Thanks to those who played along with last weeks Boxes Challenge. This weeks challenge is Give Thanks. Before I share my card for this weeks challenge, I wanted to let you know that Kitchen Sink Stamps Pre Thanksgiving Sale starts today and runs thru Tuesday Nov. 26, 2013 midnight PST. During this sale, you can save 30% off everything (except back ordered stamps). To receive the sale price during this sale, simply CLICK HERE, or use coupon code THANK30LISA at checkout. That's not all, US Customers will also receive FREE shipping when your order total $65 or more! 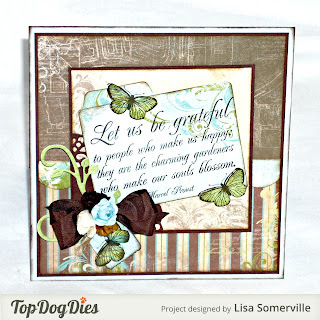 To create my card, I used stamps from Verses and Our Daily Bread Designs along with Top Dog Dies and Bo Bunny pattern paper to create my card following this weeks Give Thanks theme. 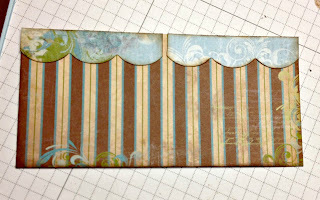 To create the file folder, I used Top Dog Dies Pocket Albums Die (TW010), die cutting the file tab panel from Bo Bunny pattern paper, then scored the die cut panel in half and stamped the quote from Verses (QQ-0852-F) in Chocolate ink. The butterflies are from Our Daily Bread Designs Stamped By Butterflies Mini, stamped in Chocolate on scraps of the Bo Bunny pattern paper, sponged and adhered to the card with dimensionals. 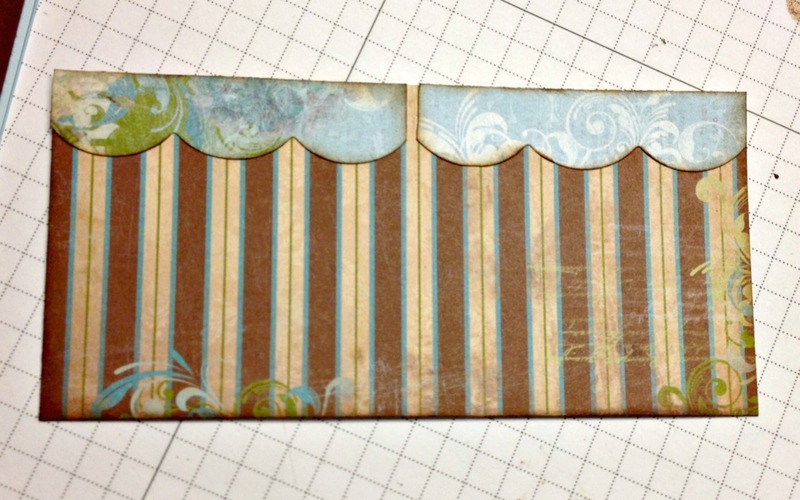 The scallop trim you see on the card was die cut using Top Dog Dies Scallop Box (TW013), die cutting from scraps of the pattern paper. Here's a close up of the scallop panel from the box top, and because my stamped sentiment covers the center, I don't have to worry about the ends meeting up. To embellish the lower corner, I added a portion of the large doily, by die cutting Top Dog Dies Cherish Doilies and Tags Die Set (TC027) from Chocolate card stock, then trimming away the unneeded portion. To further embellish my card, I die cut the Leafy Flourishes Die Set (TC016) from scraps, added a die cut tag using the Darby Doily and Tags Die, Zva Creative Mini Roses and a Vintage Brown Seam Binding bow. Thanks for stopping by, have a great weekend and a Happy Thanksgiving! So pretty, Lisa. I really like the sentiment stamped on the file tab panel. I love how you explain how you make your projects; it is very helpful! I am new follower 767. Gorgeous card Lisa, love the colors of it. 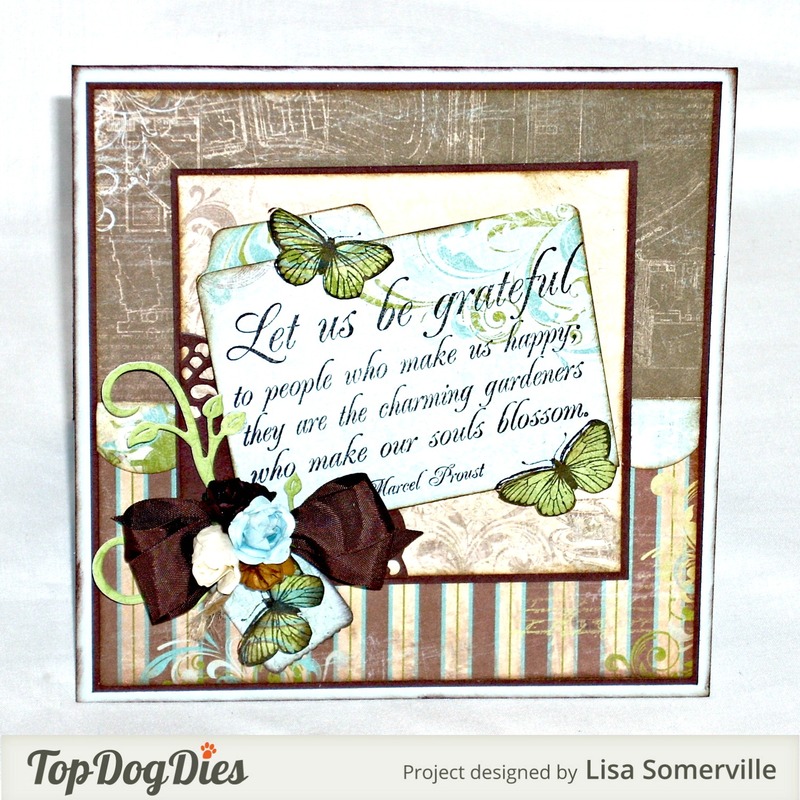 Very pretty Lisa, Lovely papers and great embellishments. I love that quote, I recently used it on one of my Photos on my other blog.